Cut slightly frozen chicken into small cubes, about ¼ inch square. In a large skillet, melt butter and cook chicken until done. Before removing from heat, add salt, pepper and bacon. Mix thoroughly and warm for about 5 minutes. Remove ½ chicken filing from the skillet and set aside in a medium bowl. Add shredded cheese and mix thoroughly. Let stand to allow cheese to melt around the hot chicken. Mix BBQ with the chicken remaining in the skillet. Remove from heat and add shredded cheese. Mix thoroughly, and let stand to allow cheese to melt around the hot chicken. One of my friends likes to deep fry the shells, but she has a special wire form to shape the wontons as she fries them. I prefer to bake the shells. But you have to add a coating to the shells don’t come out totally stiff and dry. While chicken is cooking, grease the inside of a mini-muffin tin. I lightly brush vegetable oil inside the forms. Lay out individual wonton wrappers on a flat clean surface. Use a basting brush and coat each wrapper with vegetable oil. The oil should not be dripping off the wrapper. Many recipes call for using cooking spray on the wontons. I don’t like the flavor this adds to the wrappers, but that could depend on what type of cooking spray you use. Lay each wrappers into the muffin cup to shape the shell. Bake for 5 minutes in a preheated oven. Set aside and allow wrappers to cool. Once the shells have cooled, you can decide if you think they need an additional coating of vegetable oil. If so, coat the shells on the inside while they’re in the muffin tin. Once the chicken has been cooked, and mixed with bacon and cheese, fill the wontons. 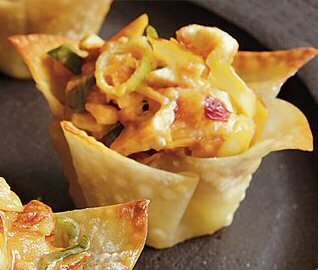 Fill ½ the wonton cups with plain chicken filling and the other ½ with BBQ chicken filling. Bake 10-15 minutes until filling is bubbly and the shells are lightly browned. Remove from muffin pan and place on a serving dish. Consider using your favorite cheese in place of the Colby Jack. Dice ½ small onion and saute with the chicken. You can also do this with your favorite pepper. Add some color and cube 1 small tomato to add to the chicken once it’s removed from the heat. To make a Mexi-chicken wrap, use a chunky salsa to add to the chicken while cooking. Replace the chicken with any cooked meat. We like to cube turkey breast after Thanksgiving, or Ham in spring, and crumbled hamburger or sausage in summer.